One of Linux's most popular desktops keeps improving. The KDE project continues work on the Plasma desktop, launching Plasma 5.6 on March 22, 2016. 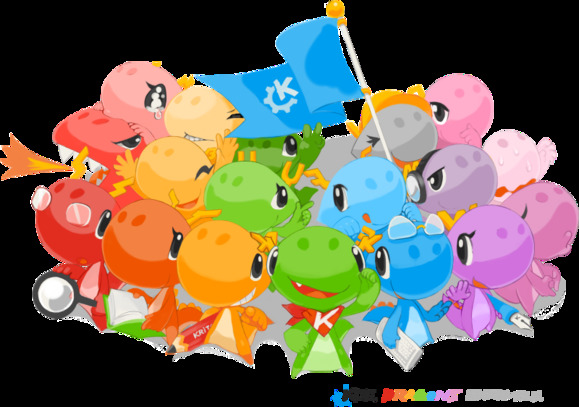 It’s coming soon to a Linux distribution near you, and you can get it now with personal package archives or try it using the new KDE Neon images. This latest release brings more desktop polish. The default Breeze theme now adopts the “application color scheme,” ensuring the entire desktop theme adapts to your color choice. If you don’t like this change, the new “Breeze Light” and “Breeze Dark” themes allow you to get the old colors back. The taskbar—known as the “task manager” in KDE parlance—has seen a number of improvements, too. It now displays the progress of tasks like downloading, copying, or moving files so you can keep an eye on them without switching between windows. Hover over a music or video player on the taskbar and you’ll see album art and media controls, allowing you to control playback directly from the taskbar. Jump lists are now available, too—right-click a shortcut and you can select quick actions. For example, you could right-click the Firefox launcher and open a new private browsing window or right-click the Steam launcher and go directly to your game library. Other visual improvements result in smoother-looking widgets, and more high-DPI fixes will help Plasma 5.6 look better on a high-resolution display. The old Weather widget has also reappeared, providing a weather forecast you can see directly on your Plasma desktop. One of many new color schemes and the weather widget on Plasma 5.6. Under the hood, there are some new experimental features that will pay off in the future. The KDE project doesn’t yet recommend switching to the new Wayland graphical server, but there are improvements here for Wayland. Plasma now offers window decorations when running under Wayland. Wayland gets other X.org features like focus-follows-mouse, and moving and resizing windows with Alt + click. KDE is working on Plasma boot themes for the Grub bootloader and Plymouth boot splash screen, which will offer a more streamlined boot experience. There’s also a new system tray replacement and a “Plasma Media Center” interface on the way. KDE’s Plasma Mobile smartphone project wasn’t mentioned. The KDE project continues to produce one of the most polished, actively developed desktop environments for Linux. If you’re a Linux user who’s never given KDE’s Plasma desktop a go and want to try something new, this is your push.